In 1992, Barcelona set the stage for the Olympic Games. The old scenery was thrown out and replaced with newly constructed sets. Gone were slum neighbourhoods—the footlights now shone on a state-of-the-art Olympic Stadium, Olympic Village, slick apartment blocks and glass-and-concrete commercial complexes. The city preened itself on its sophisticated, refurbished image. Yet the Spirit of Old Barcelona still lingers in the shadows beyond the reach of the stage floodlights. He is a swaggering Buccaneer with a wicked gleam in his eye and a rolicking zest for life. 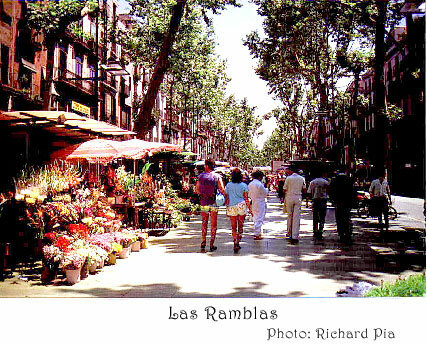 I catch glimpses of him as I stroll along Las Ramblas, a lively and crowded pedestrian street in the heart of Barcelona. He lurks behind the street entertainers who mischievously stalk the unawary on stilts, he lip-synchs along with balladeers singing their tales of love and conquest, and sneaks under the elaborate face-masks of mime artistes who offer a rose and a kiss. 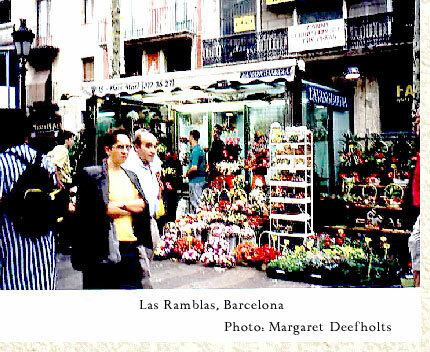 Further north along Las Ramblas, he slips between flower-market kiosks, winking at the pretty senoritas selling carnations and gladiolii and, in the chittering confusion of the bird market, he smiles as he eavesdrops on a little girl’s conversation with a chortling parakeet. Moving on, he gently touches the elbow of a stooped old man turning the handle of a tinkling hurdy-gurdy. Although Barcelona’s museums and art galleries pay tribute to Picasso and Miro, it is the Buccaneer’s alter-ego—the flamboyant artichect, Antonio Gaudi—who dominates the city. His bright colours and whimsical structures include multi-hued mosaic fountains and dragons, chimneys shaped like tiled chessmen, iron-work balconies and exterior walls sculpted into fantastical shapes. 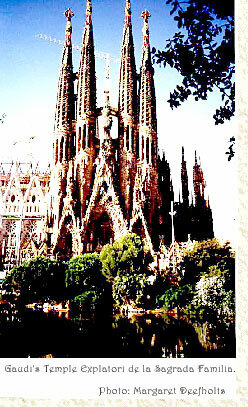 No visit to Barcelona would be complete without seeing his unfinished masterpiece, La Sagrada Familia. The original concept envisaged three facades depicting Christ’s nativity, glory and passion but only the first of these has been completed. It is an extraordinary edifice. Knobbly spires topped by fantailed-crosses. Arches crowded with minutely detailed figures which look as though they are made of graham-cracker crumbs. 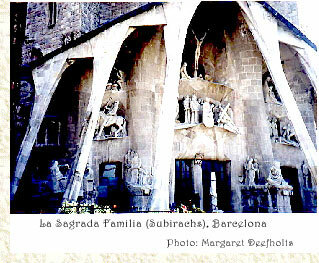 The addition of a Passion scene along the opposite facade by sculptor Josep Maria Subirachs caused an uproar of protest: in contrast to Gaudi’s exuberant ornamentation, Subirachs’s white marble figures are sleek and flowing. More conventional, but no less fascinating is the 19th century cathedral (La Seu) with its tranquil Cloisters enclosing a garden of palms, orange and magnolia trees—and a pool inhabited by geese. I overhear a tourist guide telling his group that every Easter people enjoy a traditional event in the Cloisters: a dancing egg which balances on a cushion of air generated by the central fountain’s upward gush of water. Barcelona (pronounced ‘Barkhthalona’ in a gargling lisp), was founded by the Carthegenians around 237 B.C. Fifty years later the Romans had muscled their way in, and parts of the old Roman wall dating from the 4th century still exist in the vicinity of the cathedral. Turning south towards the Santa Maria del Mar, I find myself in the small alleyways of medieval Barcelona—the artisans’ quarter during the Middle Ages. Even today the streets still bear traces of the city’s past, with names like Argenteria (silversmiths), Mercaders (merchants), Sombrerers (hatters) and Espaseria (swords), This is where Barcelona’s Buccaneer would have come on his return from the Spanish Main, his pockets a-jingle with pieces-of-eight, a cocky tilt to his hat, peering at shop windows and meeting his friends at taverns to exchange swashbuckling tales of derringdo.